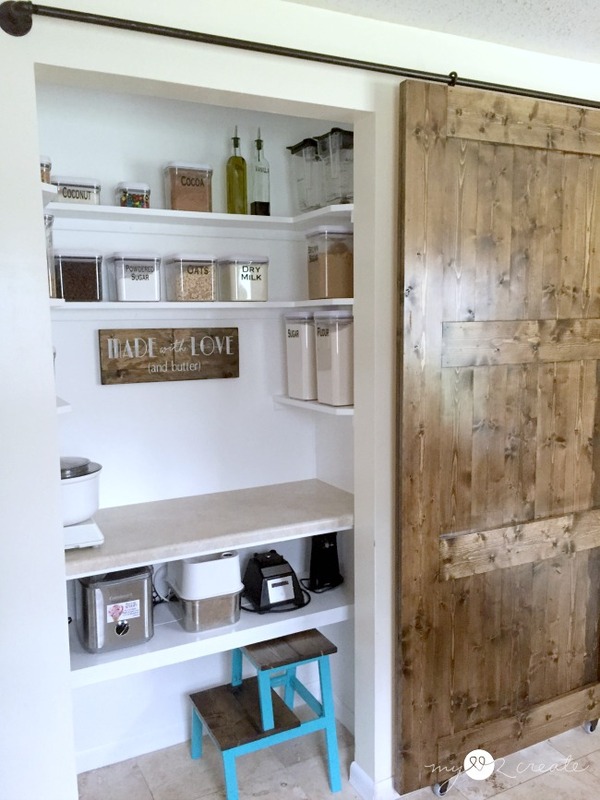 I am soooo excited to share with you how to Turn your pantry into a Baking Center!!! This is my sister's empty pantry. 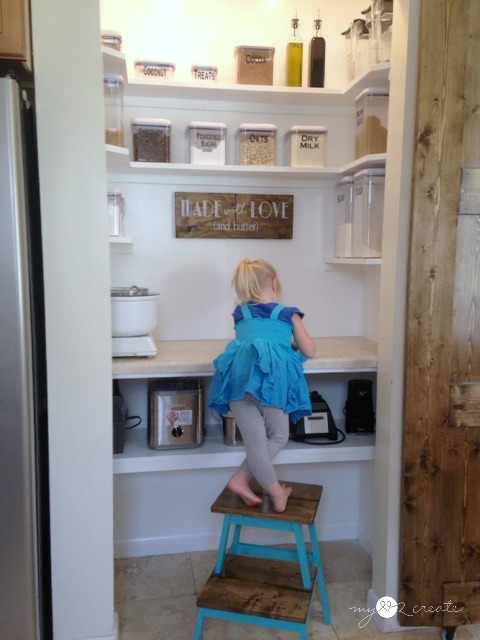 When her kitchen had a flood and needed a remodel she was able to add extra storage cabinets to the kitchen freeing up this space. You see my sister, Karen, loves to bake and let me tell you she makes yummy things! 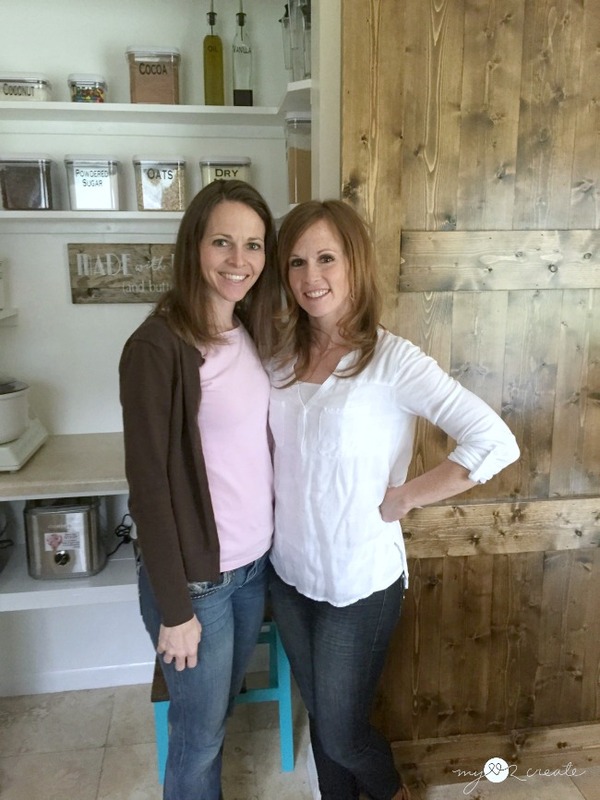 Her mother-in-law has a built in baking center in her kitchen and so Karen has always wanted her own. 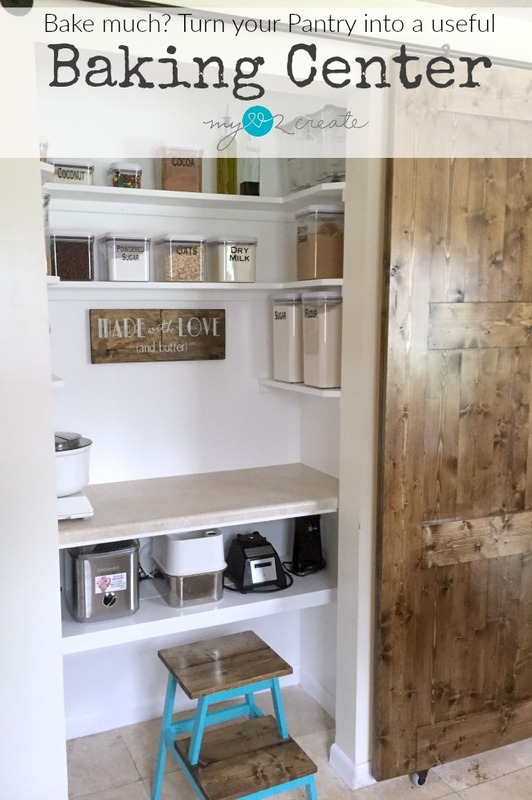 A Baking center is basically a central location where all your baking supplies/tools are at your finger tips and you whip out a batch of bread, or a pan of cookies in no time! Plus, it is super fun for the kids to dive in and help. My sister has six very adorable children and she loves to include them so they can do it as a family! This is her youngest and oldest...making cookies! This little girl melts my heart...talk about the sweetest ever! Oh wait...we are supposed to be talking about a baking center...oops! When Karen proposed this idea to me I was super excited! 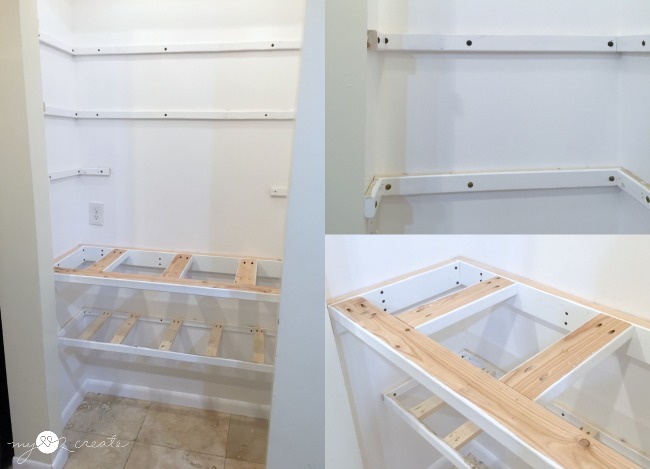 After doing my other sister's Closet/Laundry Room Makeover, this was a simple project, and I was so happy to come and help! I told her that I needed to know her design idea and to give me some measurements. She drew out some super great detailed plans. Talk about awesome!! She is amazing! 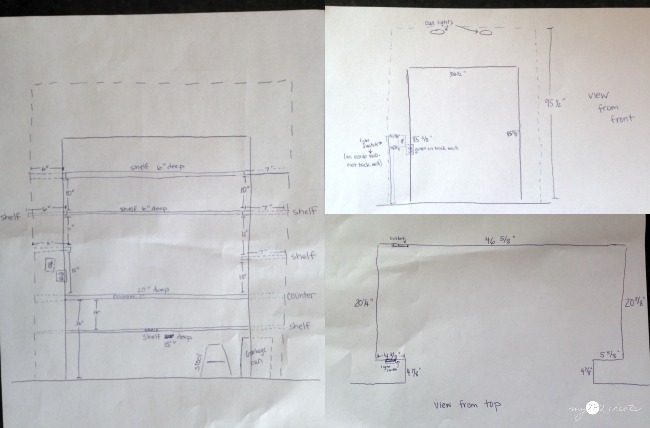 These were the plans we followed and I LOVED all precise measurements, it really came in handy when we were adding the shelves. Starting with a good plan leads to a successful project. After looking at the plans and calculating the measurements we went to Home Depot and purchased the lumber. 1x2's for the shelf supports, and 1x8 boards for the shelves. We also bought a 2x4 for the counter supports and a Counter Top . My sister lives in Des Moines and I was SHOCKED at how cheap her lumber is compared to mine....I am not even kidding it was almost half the amount! What!? So. Jealous. 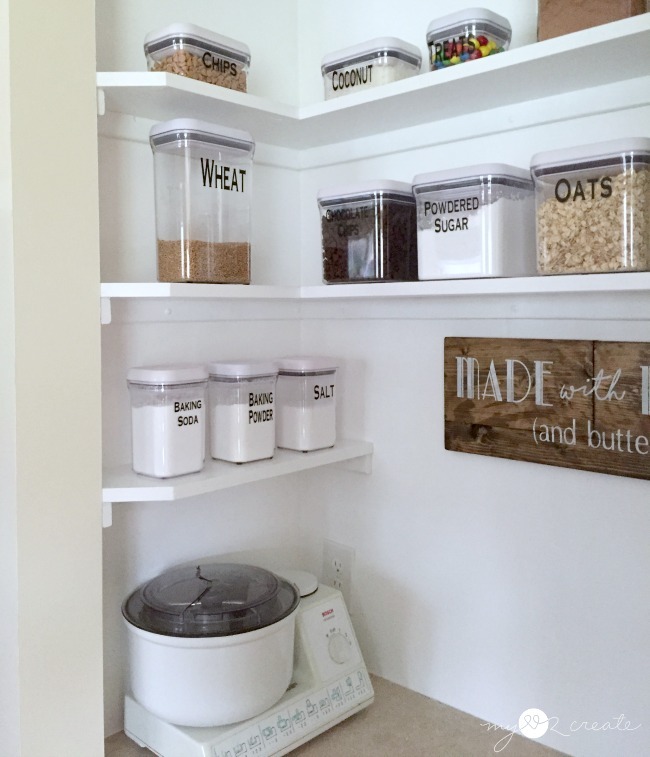 When Karen drew up the plans she had calculated the shelf spacing on what items were going in the baking center and made sure they would all fit, this is vital! 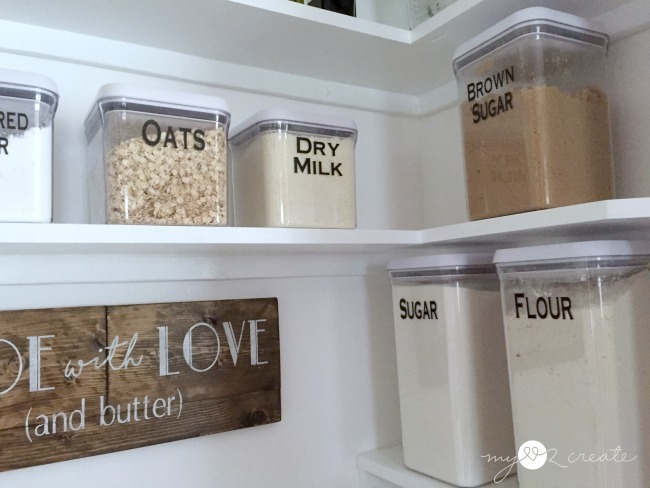 You want your baking center to fit all your supplies, so take all those things into consideration. 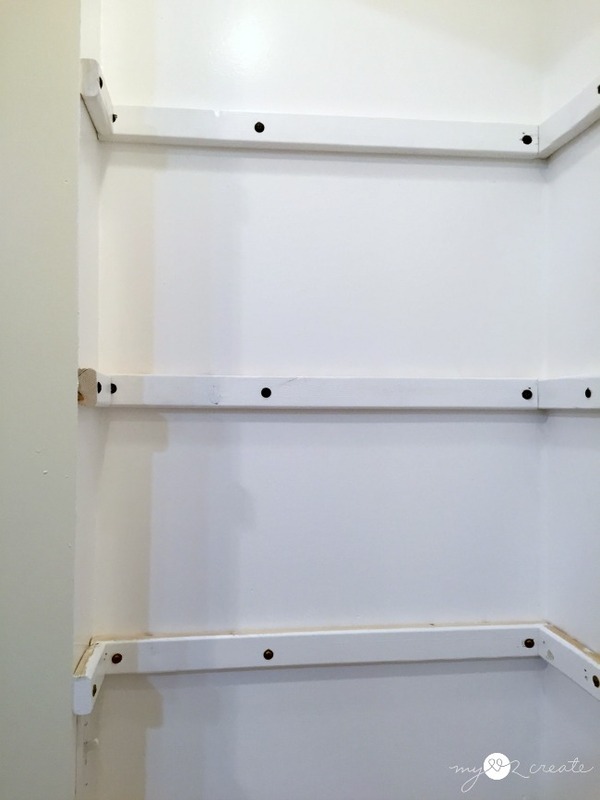 After measuring the walls and marking where the shelves needed to go, and marking where the studs were, we were able to add the shelf supports by screwing them directly into the studs. If you do not have a stud on a wall you will need use wall anchors. To save time and energy I suggest buying self taping screws...but you can predrill and use regular screws as well. We used 3'' screws on the 1x2 shelf supports, and 4'' screws for the 2x4 supports. *Tip: use a level when you are marking and attaching your shelf supports. 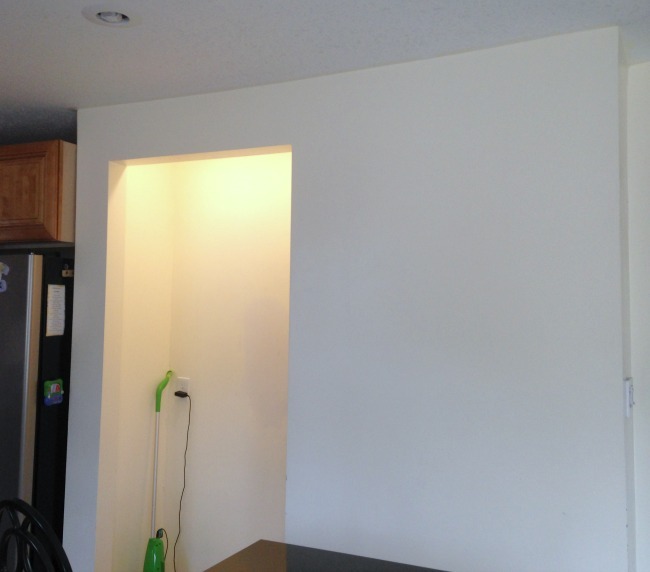 Here is the closet with all the shelf supports added, and the bigger counter support, and a lower shelf support. 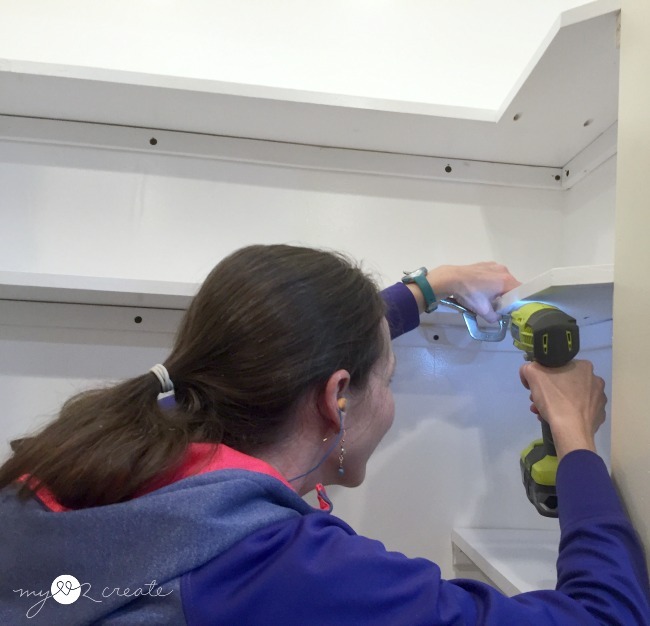 I give a good short tutorial on how I built these lower supports in my Hall Closet Makeover, when I added a bench seat to my hall closet. So check that out if you need more detailed instructions on how I built these. We had all our supports in and then realized that we had to remove some of them in order to fit the bottom shelf boards and the counter top, because the support boards were in the way. DUH!!! So be smart, first add the lowest shelf supports, then all the lower shelf boards. 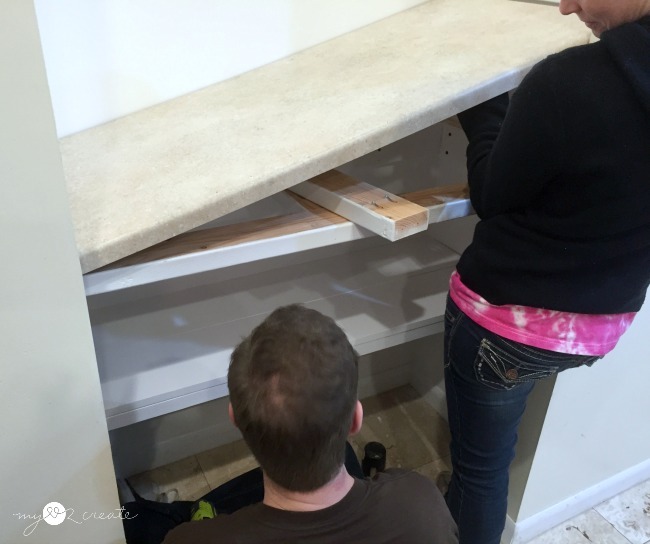 Second, attach the counter supports (make sure you are drilling into all studs and using heavy duty wall anchors if needed), and then add the counter top. Last, you can add the top shelf supports and add the shelfs...otherwise you will need help removing and holding and then re-screwing...in other words learn from my (I am not going to say "our" because it really was "mine") mistake! 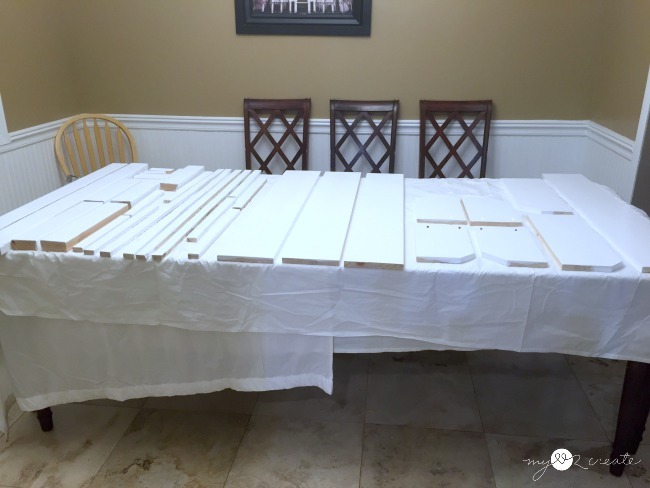 When we purchased the counter top at Home Depot, they have various sizes and finishes. The smallest one was a little too big for the space, but I knew I could cut it down with my Kreg Rip-Cut and Ryobi Circular Saw . I taped off the area where my final cut mark would be and then marked where to cut (top left). 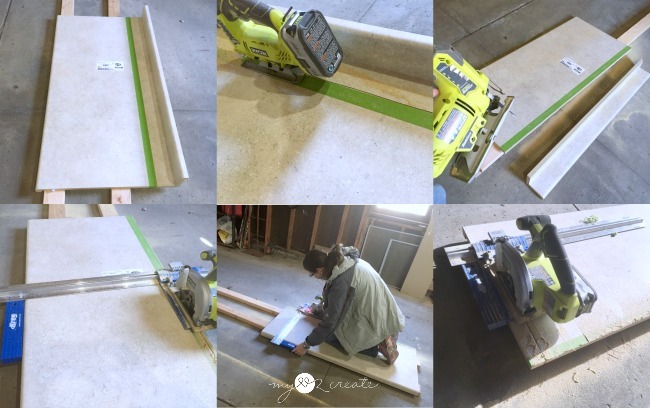 In the top middle and right photo you see I used my Ryobi Jig Saw to cut off the back part, because my circular saw would not fit...I made sure to cut bigger than my measurement so I could get a more accurate cut with my Rip Cut. On the bottom Left and middle I am guiding my rip cut to make the counter top the correct depth. The rip cut is perfect for getting straight accurate cuts without a table saw, I LOVE it. It also eliminates measuring, because you can set it to the correct length. On the counter length I needed a few inches less, but my rip cut only cuts up to 24'', so I subtracted the amount from the overall length and that gave me the amount I needed to cut off the end (bottom right). Then I made sure it fit in the pantry space...again very important walls are not even, I think I had to shave some off one of the back corners to make it fit. In this shot you can see I have clamped my side shelf to my back shelf and I am attaching the two shelf boards together with pocket hole screws. I had previously nailed the shelf boards down into the 1x2 support with 2'' finish nails. They are nice and sturdy. I also notched off the side shelves (when I cut the boards) at a 45 degree angle from where they come out from the wall, just to avoid a sharp edge. You will want to mark these spots on each board from the wall when you are measuring to cut them, because again, (say it will me) "walls are not straight", and they will all be slightly different. For the very bottom shelfs I used two 1x8 boards and nailed them into the supports with 2'' finish nails. The counter top was screwed on from underneath through the support boards with 2'' screws, in fact, I think my brother-in-law did this part. Yay for lots of amazing help! It was so awesome to have all the shelves and counter installed, but we were not done yet! 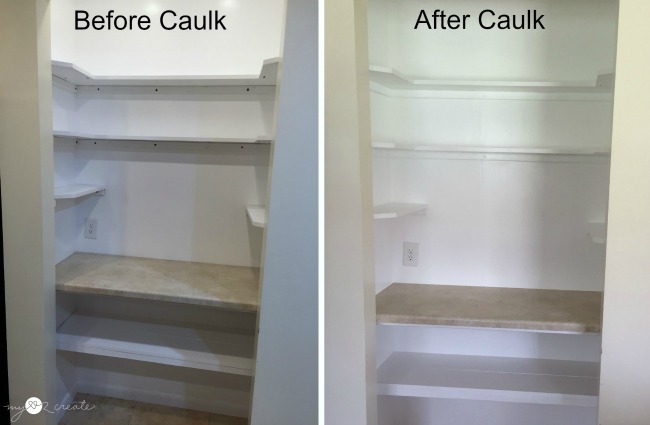 Can you see what an amazing difference caulking makes?! TOTALLY worth it. Karen did all the caulking while I was cutting wood for the barn door or making the stool, I am not sure which one I was working on! She did an awesome job! Make sure to do all the edges, where the shelves connect to the wall and seams where the supports connect to the shelves...it makes everything look clean. Because we painted the shelves first we didn't need to paint after caulking, maybe a few touch up spots, but believe me it is easier to paint first. Now all we had to do was add my sisters baking supplies and equipment! This is the fun part, putting it all together! 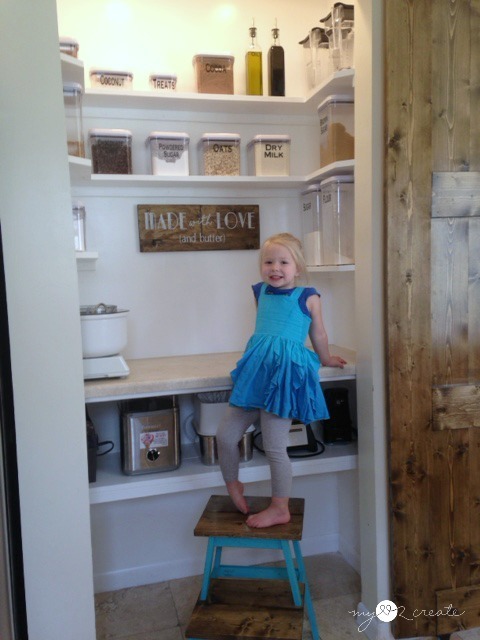 The lower shelf is perfect for her mixer, ice cream maker, grinder, and blender. 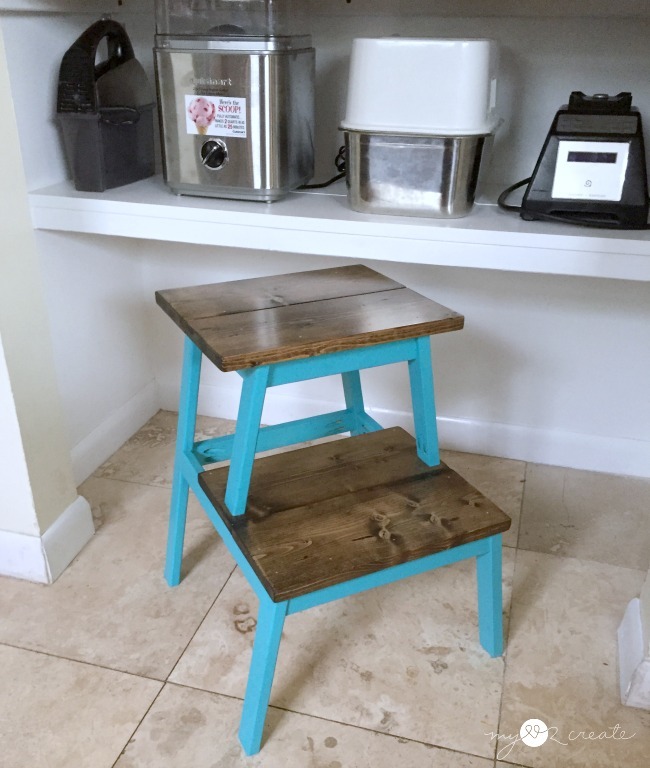 I built this stool off of an inspiration picture, but didn't draw up plans (because of time, but I should have!) It was made from left over scraps from the closet and I made sure it would fit under the lower shelf. It turned out cute, but with the angled cuts it got a little...interesting... I will have to draw up real plans and share it later. See how perfectly it fits!? 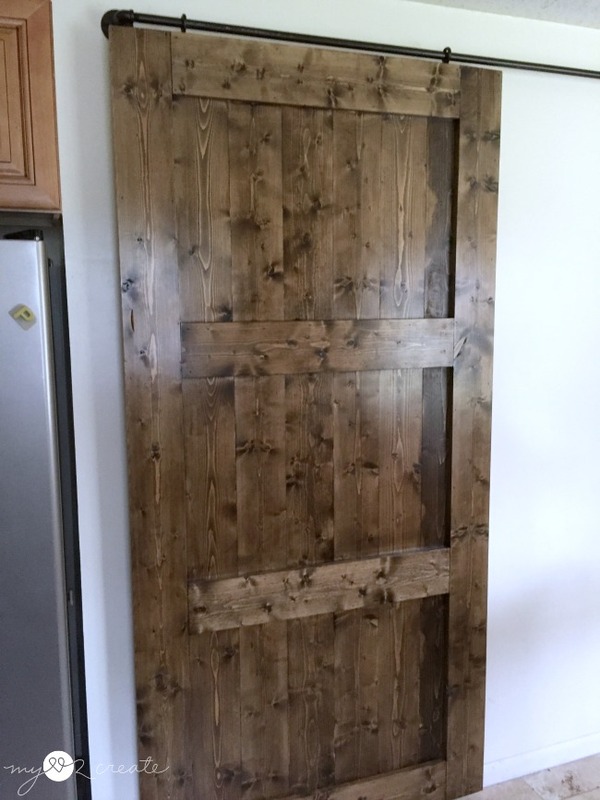 You can also see the beautiful sliding bard door we made!! LOVE!!!!! I will also share a tutorial on that later on. If her kids are anything like mine...then she will need close it off, or those chocolate chips and treats would disappear pretty darn quick! Ha ha! My sister introduced me to these awesome OXO Good Grips POP Containers that...wait for it...SEAL! Yes, pure genius. Keeping everything fresh. We used my Circut Explore Cutting Machine to make labels with black vinyl and filled them up. She had a lot of these containers already, but we may have run to TJ Max to buy a few more...a couple of times...we just, couldn't. help. our. selves. Don't they look ADORABLE!? Good grief this part was so much fun!! We even made a sign with pieced together scraps. My sister came up with the saying, "made with love (and butter)". Cause we all know everything is better with butter. It is her theme. :) In fact, Karen designed it, and I showed her how to cut the stencil on my Circut out of contact paper, and stencil it on the board. You can see how in my How to make your own signs post. There you have it a useless pantry turned into a very fun and useful baking cupboard! 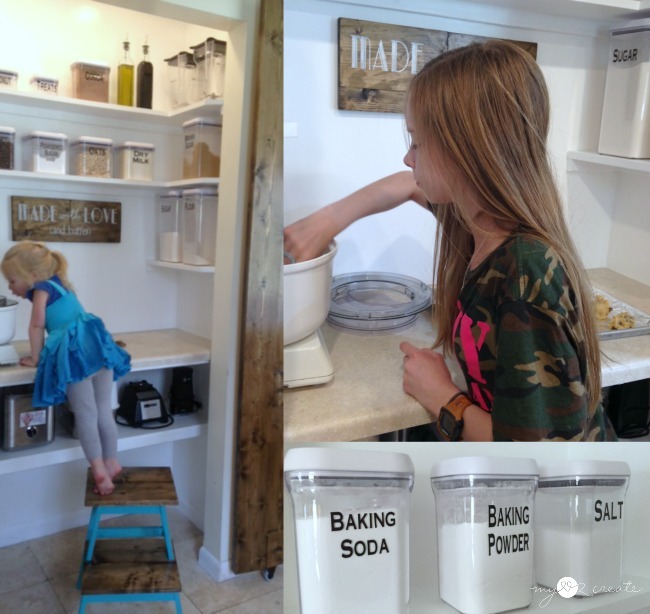 If my sister needs to add more stuff there is plenty of room...Oh, did you spy what was different about the the oil and vinegar jars? Yep, it is oil and Vanilla! We thought that was cleaver! :) Told you we were having fun! Here is a fun before and after shot! Here is a shot of my beautiful sister! I love her and her family so much! I just wish we lived closer together! So what do you think? Would you use a baking center? Thanks so much for stopping by, I would love for you to follow me on Pinterest and Instagram! Love it! 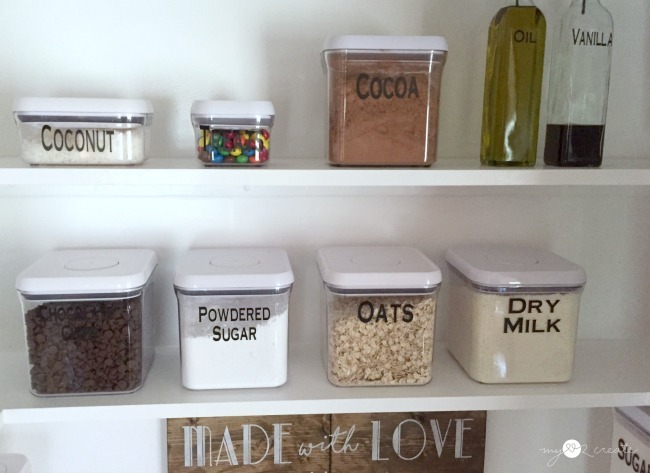 Maybe I would actually get some baking done if everything was in one place! How nice that you got to spend time with your sister and could work on a project together. You guys made a great team! What a clever idea. Love how it turned out!! Thanks for sharing with SYC. 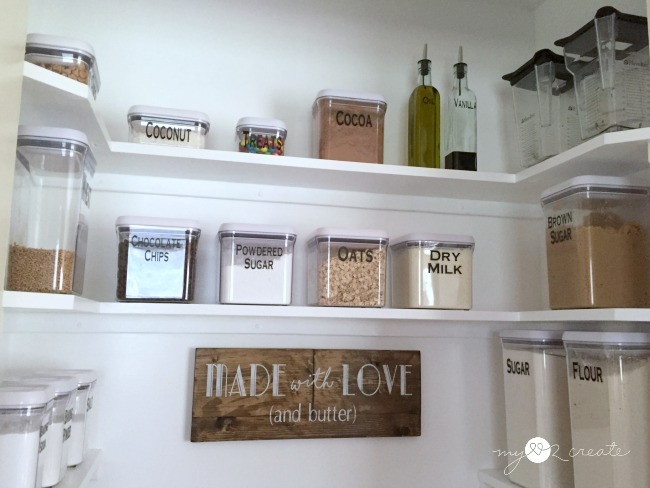 Fabulous space saving idea, I only wish I had a pantry to convert! Pinning this great project! 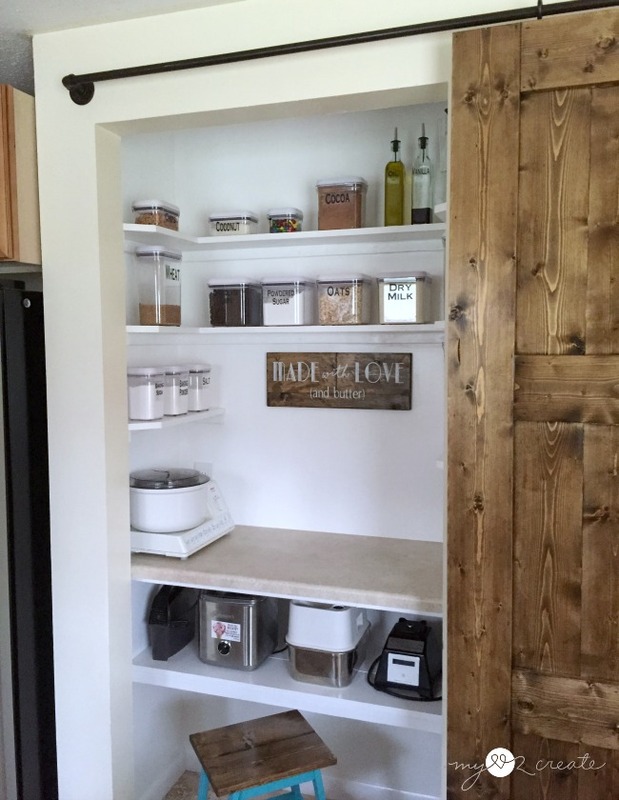 I had no idea anyone needed a "baking center" but now that you've shown me this... what a fabulous idea! I love how it turned out Mindi. You are so creative and talented! This is so amazing! 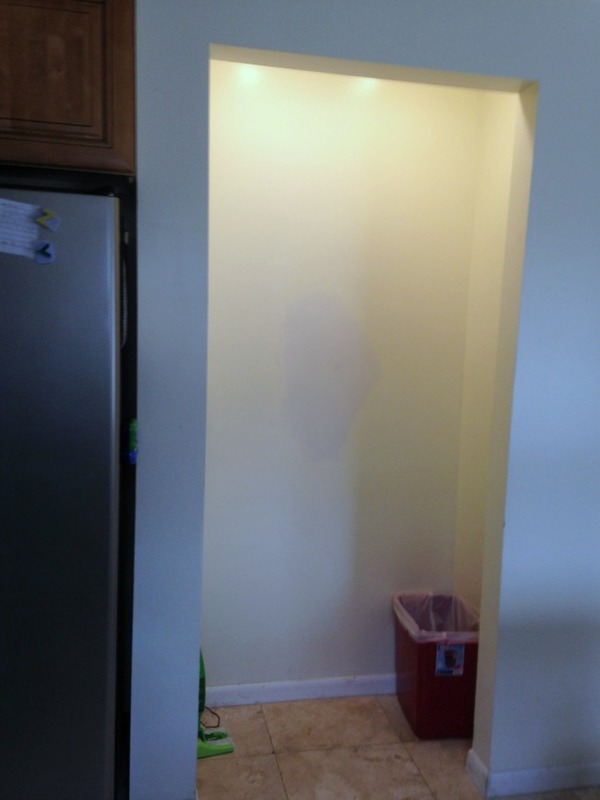 What a wonderful little space to bake, and that door... Awesome!